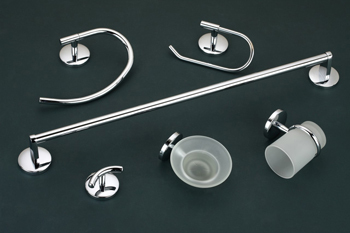 Our 6 piece bathroom hardware sets are value for money without compromising quality or style. Just like buying in bulk from Costco can save you money, our 6 pack sets of bathroom accessories cost the same as what others sell 1 piece for. Thinking you don’t need all 6 pieces? Well, even if you think you just need 1 of the pieces you are ahead and being a savvy shopper. Left over pieces are bonuses, and you may find that you love the added touches of luxury that you hadn’t considered before. Also, don’t forget that you don’t need to restrict each set to one room. You can use the pieces in different rooms in the house. For example, don’t need the hook in the powder room? Why not use it as a coat hook next to the front door or in your wardrobe? The soap dish is a terrific accessory particularly if you have an under bench basin. But could it also be useful in the laundry or kitchen?